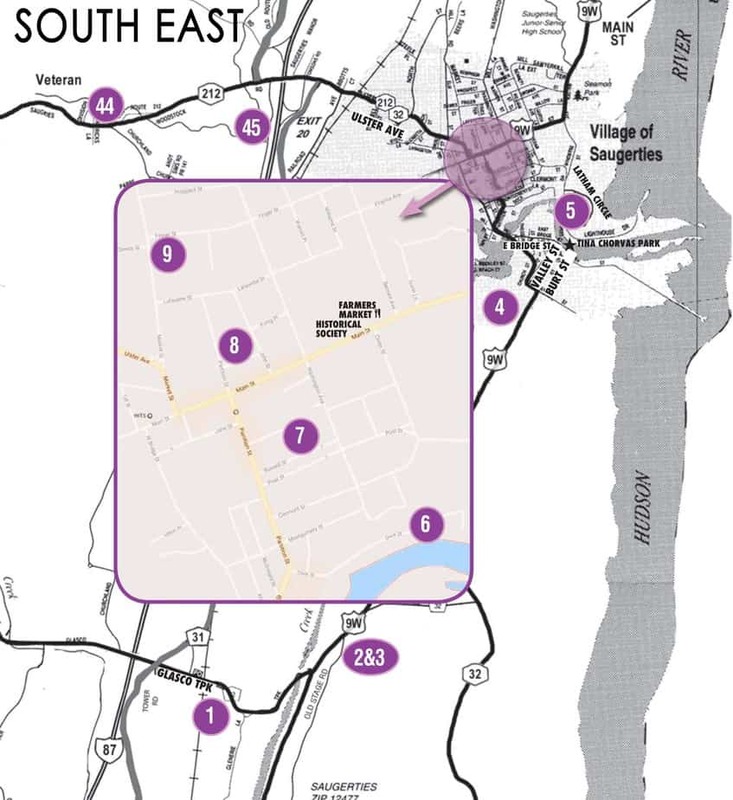 As the weather warms and we move from cozy indoor setups to shedding coats and hats in favor of enjoying outdoor events, fairs, and a whole gamut of wonderful activities, be assured that Saugerties has much to offer. Art lovers are especially in luck. This year marks the Saugerties Artists’ Studio Tour’s 15th Anniversary, an event that dazzles the eye and the imagination. The Tour takes place on Saturday and Sunday, August 12-13 from 10 a.m. to 6 p.m. each day. What does the Tour have to offer? Meet and visit with artists in their natural habitat, the studio. There are painters who work with oils, watercolor, acrylics, and encaustic paints; sculptors who use their skills to bend steel, make castings and use recycled materials to give new life to what some see as trash. Printmakers, photographers, and collagists are busily creating new work and pushing against tradition. You’ll find mixed media, digital imagery, studio furniture, and wearable art from funky to high class, as well as ceramic arts where art and function collide, plus an outdoor exhibit of land art. The creativity and depth of knowledge that these artists have attained through their love of expression must be seen first-hand for the ultimate visual experience. 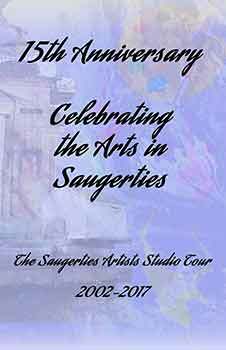 Since its beginnings in 2002, the Saugerties Artists Studio Tour has featured more than 120 artists. Barbara Bravo, the coordinator of the Tour, says, “If you put the same materials into the hands of a group of artists, the resulting array of expressions is startling and almost beyond description”. Barbara, an artist in her own right with more than 40 years’ experience in ceramic arts, has been coordinating the Tour for nearly as many years as she has been a participant. 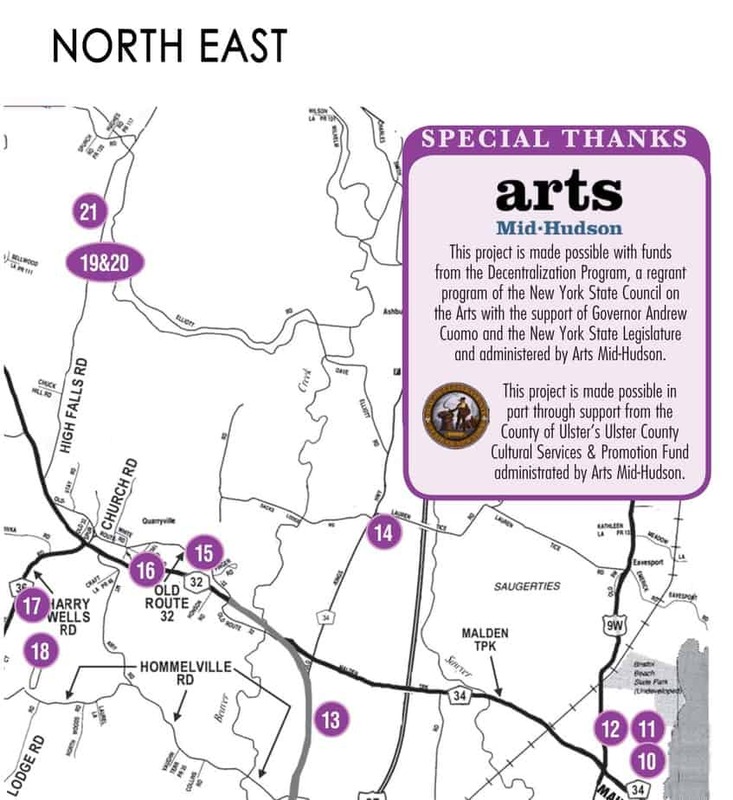 She has been acknowledged by Arts Mid-Hudson and Ulster County Executive Mike Hein as the recipient of the 5th Annual Ulster County Executive’s Award as volunteer of the year. Artists who will be opening their private studios during this year’s tour are: Isaac Abrams, Tara Bach, Kristin Barton, Ana Bergen, Barbara Bravo, Sharon Broit, David Brown, Michael Ciccone, Vinny Curry, Shelley Davis, Richard Edelman, Ruth Edwy, William Greenwood, Josepha Gutelius, Mikhail Horowitz, Brian Josselyn, Marsha Kaufman-Rubinstein, Kay Kenny, Barbara Tepper Levy, Yvette Lewis, Ulf Loven, Brian Lynch, Iain Machell, Marjorie Magid, Hugh Morris, Chris Nealon, Michael Nelson, Gustav Pedersen, Bill Reinhart, Tad Richards, Jacquie Roland, Prue See, Sarkis Simonian, Michael Sullivan Smith, Viorica Stan, Raymond J. Steiner, Marck Webster, Alison Winfield-Burns and Carol Zaloom. In addition to opening their studios during the Tour, many of the Tour artists have received awards and special invitations to show their work throughout the region. Ruth Edwy, a gifted abstract landscape artist, has had one of her paintings selected for inclusion in the movie Furlough that was filmed in Kingston. A newcomer to the 2017 Tour, Alison Winfield-Burns had her oil portrait “Oscar Wilde” acquired by the Leslie-Lohman Museum in New York City, while another newcomer, Marjorie Magid, has been invited to have a one-woman show at Manhattan’s Goddard Riverside Community Center in March. Artists are resourceful and use all their talents to make their way in the world. Carol Zaloom, well-known for her linocut prints, often teaches workshops at the Woodstock School of Art, where she will be offering an Illustration class this summer. Josepha Gutelius’ paintings are receiving an enthusiastic welcome to the art scene. She has received several awards including First Prize at the International Juried Competition and The Center for Contemporary Art, New Jersey. 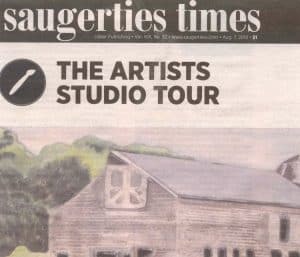 Not content to making art available to the public for just one weekend, from July to mid-August Tour members will be filling the windows of many Saugerties businesses in the heart of the historic, picturesque village. ArtSites is designed for a casual stroll on a summer’s day or evening. 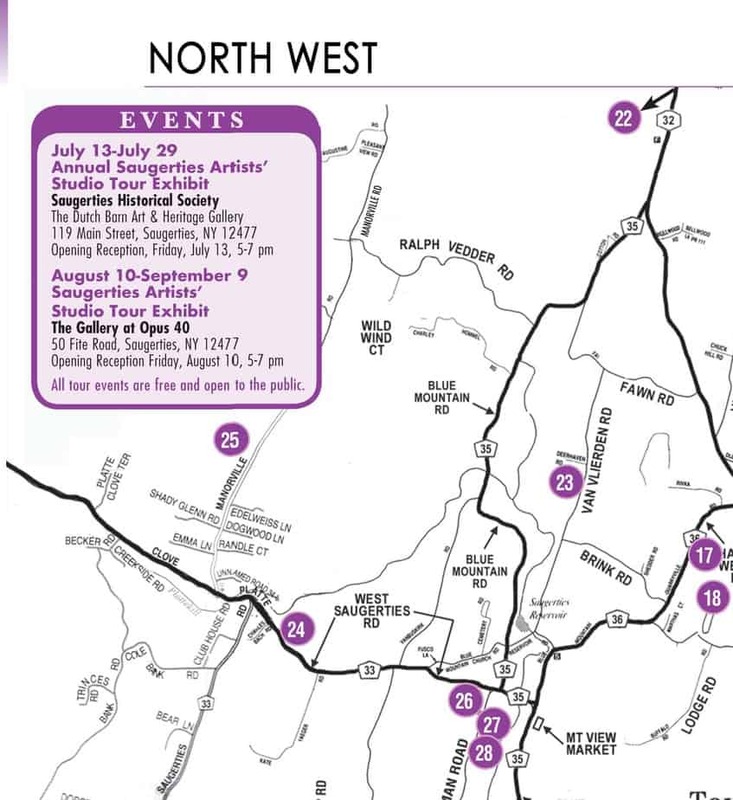 In addition to all the art lovers who visit our studios, the Artists’ Tour thrives because of the tremendous support from the Town of Saugerties government, Kiwanis Club, Arts Mid-Hudson, Chamber of Commerce and the business community. Detailed information about the tour can be found on the Tour’s website, www.saugertiesarttour.org. The Tour is free and open to the public, no registration required. 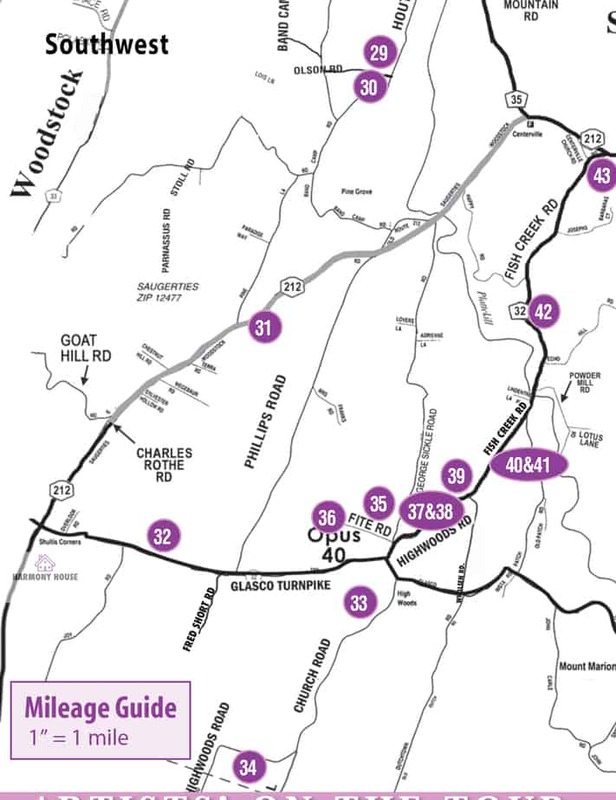 Just pack up the car, pick up a map at many Saugerties business locations and enjoy an artful weekend.